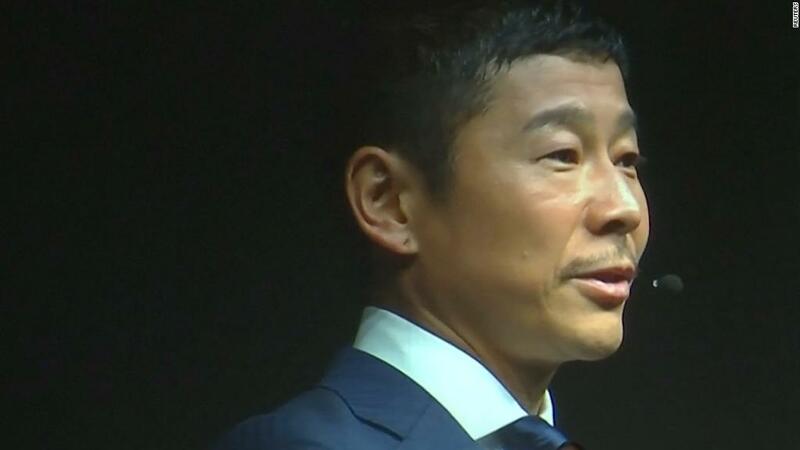 Japanese billionaire Yusaku Maezawa has made a name for himself as a rock musician, an online fashion mogul and, now, Earth's first moon tourist. 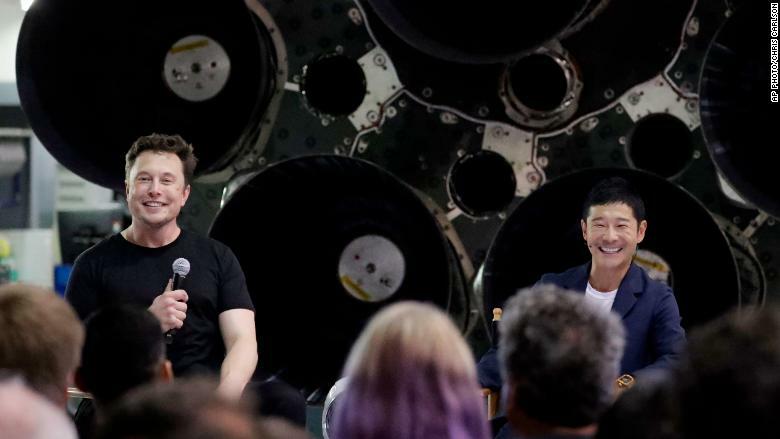 The 42-year-old tech tycoon made headlines Tuesday when SpaceX revealed that Maezawa has chartered a flight aboard the company's Big Falcon Rocket, which is still being developed, for a slingshot trip around the moon as soon as 2023. He's planning to take six to eight artists with him, and he won't be charging them for the ride. Maezawa made his fortune in e-commerce, but his first love was music — an industry in which he made the transition from artist to entrepreneur. He started an indie rock band in high school, releasing an EP in 1993. He skipped college to follow his then-girlfriend to the United States, where he started collecting CDs and records of bands he liked. SpaceX CEO Elon Musk and Japanese billionaire Yusaku Maezawa. Maezawa will be SpaceX's first space tourist. When he returned to Japan in 1995, he started an import music business, selling CDs and vinyls of his favorite bands by mail from his home. In 1998, he used the mail-order music business to launch Start Today, naming the company after an album by punk band Gorilla Biscuits. That same year, Maezawa's band, Switch Style, signed with the label BMG Japan. He released three albums with them before stepping away to focus on his business. Maezawa is a rarity in Japan: a billionaire who shuns suits and encourages his employees to have fun. 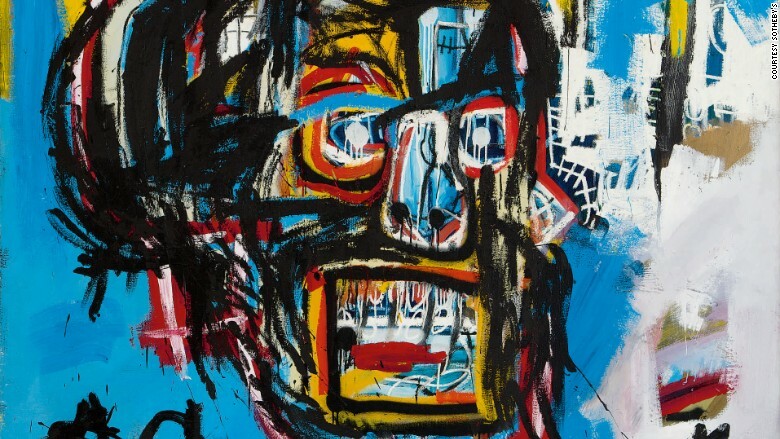 Yusaku Maezawa paid $110.5 million for "Untitled" by Jean-Michel Basquiat last year. At an annual results presentation last year, Start Today CFO Koji Yanagisawa delivered the earnings report dressed as a mushroom, saying he was carrying on a tradition started by Maezawa in 2010. Last year, Maezawa dropped $110.5 million on a Jean-Michel Basquiat painting, the highest ever price paid at auction for a work by an American artist. In an interview with the Observer, Maezawa said that while he'd always had a deep interest in art and fashion, he didn't start collecting until about 10 years ago. He's building a museum in his hometown of Chiba and has been scooping up art at a feverish pace. He had set the previous auction high for Basquiat months earlier, bidding $57.3 million for an untitled painting at Christie's. In 2016, he also purchased a work by Pablo Picasso for $22.6 million and several other expensive pieces. Forbes estimates Maezawa is worth $2.9 billion, so he's got deep pockets to bankroll his art addiction and space ambitions. The ex-musician is currently dating famous Japanese actress Ayame Goriki. No word yet on whether she'll snag a seat to the moon. -- Jackie Wattles contributed to this report.